& from Wales / Cymru including Thompson. Hvis Lyset Tar Oss was recorded by Varg Vikerness at some point between January 1992 and March 1993, along with his previous work (Burzum, Aske, and Det Som Engang Var) and the album that would follow, Filosofem. The recordings took place at Grieg Hall in Vikerness' hometown of Bergen, Norway, and were spread out across many months with long gaps between releases. It was during this period that the Norwegian black metal scene was gaining notoriety, due to not only the extremity of bands such as Burzum, Mayhem, Emperor etc, but also activities outside of music. Violence was become rife within the scene, and a string of church burnings in Norway led to the scene being scrutinised. This would come to head in August 1993, when a disagreement between Vikerness and his friend, Euronymous, would result in the grisly murder of the Mayhem guitarist. In May of 1994, a month after the release of Hvis Lyset Tar Oss, Vikerness was given the maximum sentence of 21 years imprisonment for the murder of Euronymous, along with various other charges of arson, theft, and storage of explosives. The music features the lo-fi recording style that Vikerness had championed since the debut Burzum album. The guitars are raw, the vocals inaudible, and drums almost indistinguishable from tin can. Yet within this cacophony lies a subtle ambience that shrouds the cold and bitter vibe that spills from the album. This would be fully realised on Filosofem, but Hvis Lyset Tar Oss can be considered proto-atmospheric black metal, with its influence still heard today among bands such as Panopticon, Leviathan, Deafheaven and more. There were 2000 numbered copies in the initial pressing of Hvis Lyset Tar Oss on white marbled vinyl, which was released by Misanthropy Records. This copy is number 1466, as indicated by the small sticker on the rear of the sleeve. The black and white, stickered gatefold sleeve features a drawing by 19th century artist, Theodor Kittelsen, name Fattigmannen (The Pauper). 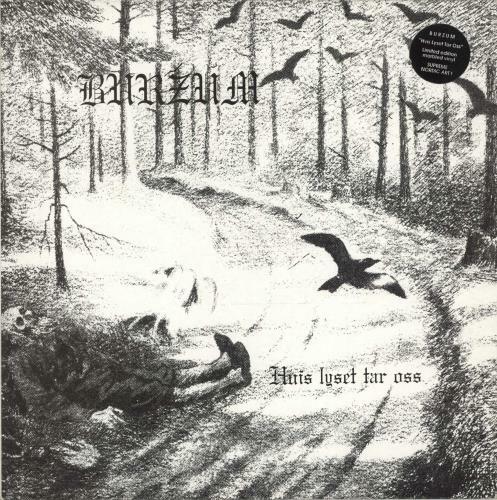 All of the text throughout the sleeve, including the lyrics, remains in Norwegian, and includes thank you credits to Fenriz of Darkthrone, and Demonaz of Immortal. This copy also comes with a period merchandise insert, and a newsletter from Misanthropy Records, which features a particularly moody black and white image of a young Varg Vikerness. The hand scratched runout groove etchings note the AMAZON001LP catalogue number, as well as 'FRIHET FOR GREIFI GRISHNACKH', which loosely translates as 'Freedom for Count Grishnackh'. The overall condition of this copy is, quite frankly, fantastic. The stickered gatefold sleeve shows some slight corner rubbing to the opening edge, but the spine is completely legible and other than one or two fair creases on the rear, it is in excellent condition. The same can be said for the vinyl. There is but one slight spindle mark on each side to indicate that this has been played, but it has remained in spectacular, near 'as new' condition for nearly 25 years in the wild. This is the first copy we have ever seen here, and original pressings of Burzum records rarely come up on the open market. Regardless of opinion on Vikerness himself, the impact of Burzum's early output within the lexicon of extreme music cannot be understated. This will likely be a onetime only chance to own a piece of black metal history. Product Information Burzum Hvis Lyset Tar Oss - White Marble Vinyl - 1st UK vinyl LP album (LP record).